It is that time of year again! Canadians are preparing to meet heavy snowfall and freezing temperatures but winter doesn’t need to be unbearable. With the help of our Calgary snow removal and salting, this season can be fun instead of a chore. There is a sense of joy that comes with seeing the first snowfall of the season. As it starts to build, however, layer by layer, that sense of joy fades away to make way for frustration! 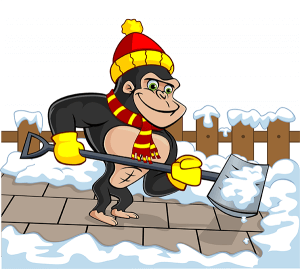 Back-breaking labour, calloused hands and slips and falls are all problems that can be eliminated when you outsource your Calgary snow cleaning and salting to our Gorillas. The experienced technicians at Gorilla Property Services are highly trained in outdoor safety measures and we always operate insured! With every risk eliminated – you have nothing to do but sit back and relax while we do the heavy lifting. Instead of being limited to the slow-moving process of shovel-removal, our Gorillas come with options in order to best suit the needs of your property. Operating on a commercial level? We are equipped to handle parking lots, walk ways and any other snow covered spaces. Need snow removal on a residential space or strata environment? Our Gorillas will come running with shovels, snow blowers and good old fashioned elbow grease in order to clear a path to your door. You never have to worry about being caught by surprise with our Gorillas on your side. Monitoring weather forecasts is one of our favourite pass-times at the Gorilla offices. By always being informed, we are always prepared. Our Gorillas operate in the early hours of the morning or the late hours of the evening. We strive to give you the best possible results, no matter the time of day.